Opening Times: Club times (Blackwater, summer only) Tue 2000, others unknown. No public times. 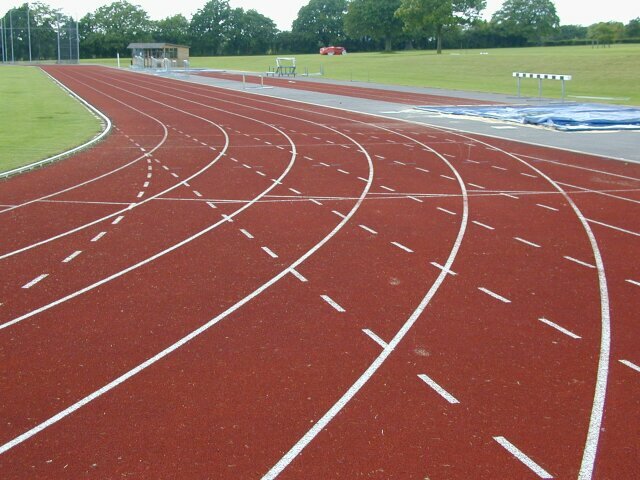 The track is owned by Charterhouse School and was opened in September 1996 by Sir Greville Spratt, a former Lord Mayor of London and Captain of Athletics at Charterhouse. The surface is Spurtan BS and a PA system is available. There is a small pavilion at the track which is used an announcer's hut and as a temporary store. There is a 6 lane 60m straight on the synthetic infield just inside the first bend and there are no less than 12 places for LJ with 6 on a 3 lane double-ended runway and 6 more at the 300m to go point as there is a pit off the end of the straight.